D.A.R.E at Media Education Summit in Hong Kong | D.A.R.E. 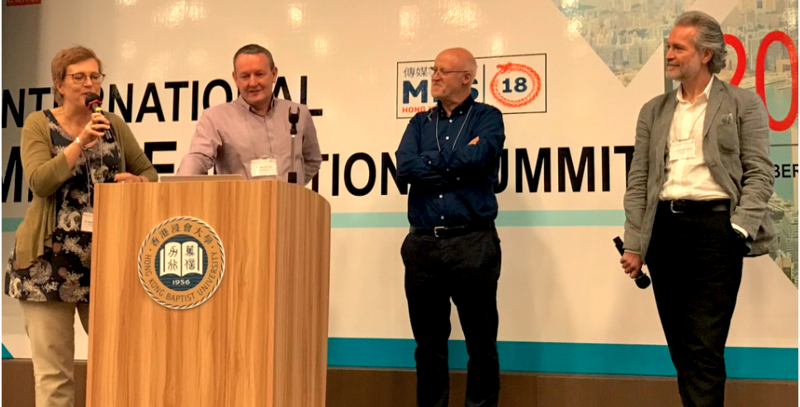 Andrew Burn, John Potter and Michelle Cannon represented D.A.R.E at the International Media Education Summit held at the Hong Kong Baptist University, 1-2 November 2018. Each year the Summit brings together a global network of researchers, educators and practitioners working across all aspects of media education, and digital & media literacy. Now running for 12 years, MES is convened by the UK’s Centre for Excellence in Media Practice. John Potter, Andrew Burn, Michelle Cannon and Mark Readman (Session Chair) in the post-presentation Q & A. The conference brought together media education scholars and practitioners from dozens of nations with a large and refreshing representation the Asian-Pacific region. Andrew, John and Michelle delivered a keynote around their article Dynamic, Playful and Productive Literacies in which they reflect on contemporary media forms, pedagogy and learner agency that connect with the wider lived experience of young people and digital cultures. Andrew finished by underlining the importance of the digital media arts in multiple forms, and the risks associated with media learning soley framed around the negotation of fake news. The conferene also featured a Youth Media Education Summit organised by Dr Marketa Zezulkova (Assistant Professor in the Institute of Communication Studies and Journalism at Charles University – Czech Republic). Under the guidance of their teacher Iain Williamson, media students from The South Island School in Hong Kong, attended specially tailored sessions and made this short film in one day. We look forward to the next Media Education Summit (2019) which will be UK based.